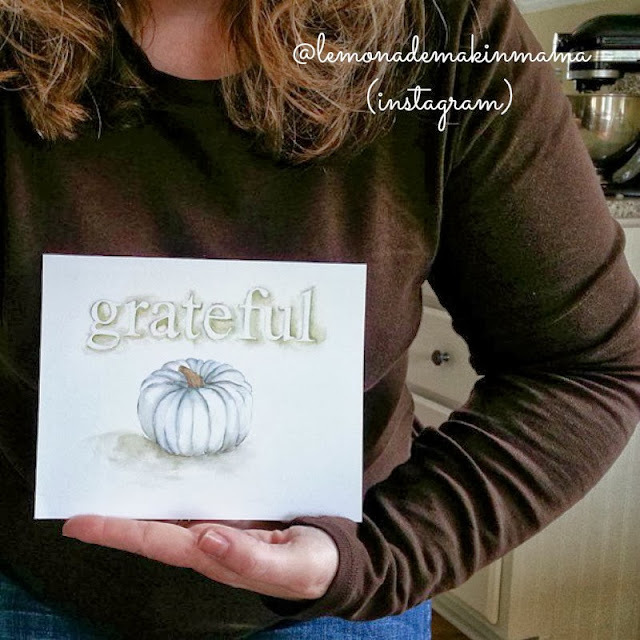 Lemonade Makin' Mama: Giveaway with the Rustic Ribbon! The winner of the Rustic Ribbon oilcloth trash bag is... Lori_r8. Give me a shout at lemonademakinmama@comcast.net to claim your prize girly! I'm super excited about this giveaway today. (And yes I know, I say that about every giveaway. It always makes me laugh when I realize that I say that every time because I do that with people too. It's kind of a running joke that I'll be talking to my family at dinner, often sharing a story about a person... and then I'll almost always conclude with, "I just love her.." Then my kids will laugh and tell me that I say that about everyone. I suppose I'd rather be known for that, than the opposite. Ha! Anyway... we're here because I'm giving away something sweet and you'll love it. Trust me on this. I'll get to it in a second. I've already shared a few of the fabulous creations from The Rustic Ribbon (above) in the past. She made these little oilcloth car trash bags. I know, right? The cuteness factor is sky high here obviously, but c'mon tell me a person who doesn't need one? I can tell you first hand that it also holds markers and pencils and small notebooks perfectly, for ten-year-olds who steal it and hang it over the headrest in front of them. I'm just saying. Today Sarah at the Rustic Ribbon is graciously offering one to a lucky reader and she is also offering a 20% off coupon code for you if you want to load up on goodies from her shop. Wouldn't this be a darling gift bag too? You could tuck all kinds of treasures inside! I'm thinking teacher gift bags with a pretty box of tea and some tissues in it... or for your budding artist, why not stock it with one of Sarah's pretty notebooks and some colored pencils? I could go on and on giving you ideas. The point is, this is awesome and you probably need one. Also... For those of you on Instagram, you can also follow sweet Sarah @therusticribbon, and lastly, she does custom orders so tuck that away too. I'm lovin' the black print lined with yellow polka dots. What a classy way to have a little trash bag in the van/car! Great idea! p.s. Sasha, those mini-prints are SWEET! I would love to car trash bag in the cherries print, would make a cute scrap holder for my sewing table. p.s. Love the mini prints Sasha!!! i love the yellow gingham trash bag and the polka-dot ruffled clutch! I love the ruffled clutch! 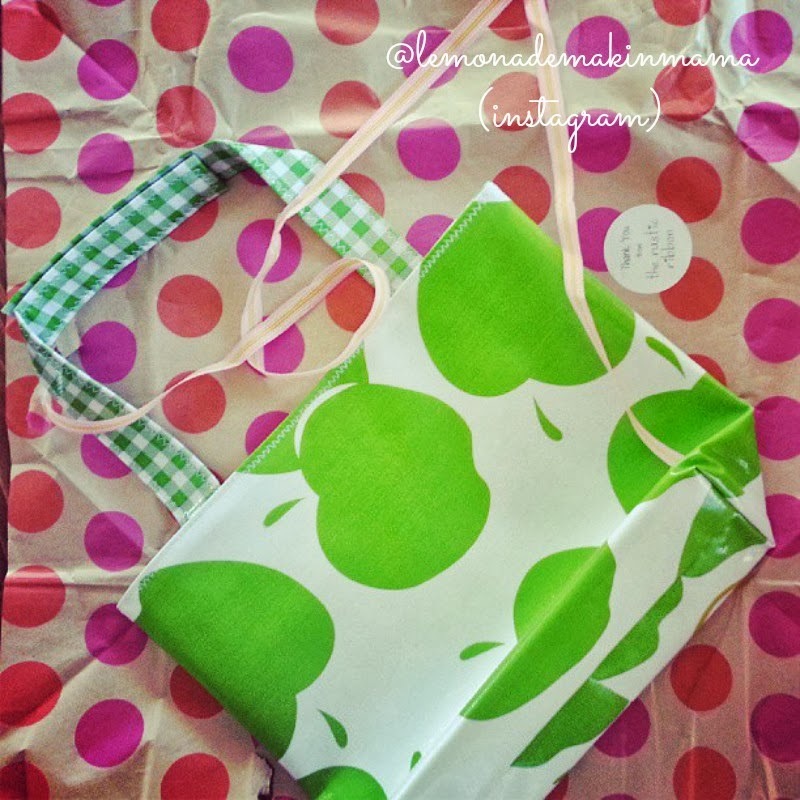 The car trash bag in the green apple print is my favorite! So pretty! I would totally want the one with the floral print and the blue background with red polka dots inside! Cute. Thanks Sasha for another great give-away. :-) Have a blessed day! 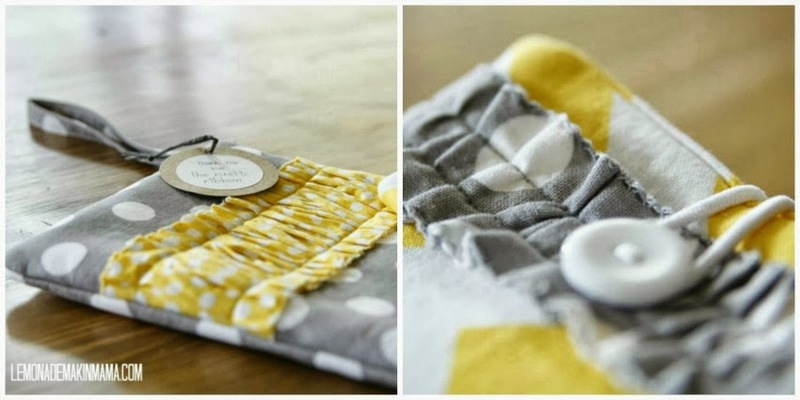 I LOVE the yellow and white chevron with gray and white polka dot notebook cover. That would be perfect for my crochet order notes. Especially since it has pockets for pens. And I snagged 3 Ball Jar towels last night! Woot Woot! I like the red and white car trash bag. Cute! i love that cherry trash bag ... although it's almost too cute to be used for that! and the journals ... so cute! I love all of the journals- would love one for a Christmas gift for my girls! 1) I love the trash bags--all of them. 2) I love the journal with the Paris love and Red polka dot with turquoise. 3) Your stuff ROCKS! I love the grateful sign. I favorited so much I will have to pace myself. Ha ha! oh my! Love all of her shop! If I pick one - ruffled clutch. but man that red and blue with white polka dot journal was awesome and my car could use a trash bag. I love the cherry car trashbag. Super adorable. I have told all my instagram followers to check out therusticribbon. 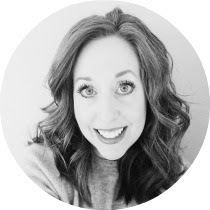 I am excited to be following Rustic Ribbon on twitter. I cannot wait to see what other stuff she comes up with for the holidays. I don't think my first comment published....promise I'm not trying to get extra entries...I said my fave was the yellow chevron and gray polka dot journal? Anyway, "Elle Bee" should have a total of 2 entries...one for a fave and one for FB sharing. Sorry for the confusion! Oh, how I love journals. Her items are lovely! The cherry oilcloth bag is precious! Super cute! I think this: http://www.etsy.com/listing/157955597/ruffled-clutch?ref=shop_home_active is too! Love, love the trash bags. I don't know how but two boys in the backseat can create alot of grabage. I love the blue floral car trash bag! mmm hmmmm.. those trash bags are the bomb! Being a green lover.. I would have to pick that gorgeous apple one, although the red one was beautiful and I can see me loving that one just as much. Love the car trash bags - such a great idea! I love LOVE the apple printed car trash bag! Let me just say I've actually been looking for one of these and hers are so much cuter and around the same price of the others I've seen. I love them all but I really love the black and white print bag with yellow polka dot lining. Super cute! I love the blue trash bag with the red polka dot lining. I could really use one of these in my car! I have a 2 1/2 year old and a 10 month old! I love the cute red one!! What a great idea! Love it. Oilcloth is the bomb. And yay for the mini. Great idea for the car! I love the grey polka dot ruffled clutch! Love the clutch and the journals! Very cute patterns! I LOVE the gray/yellow polka dots/chevron journal A LOT! Love the blue strawberry print! Such a great product! Thanks for sharing! i love the balck and white with yellow polka dots!i also pinned and following now on instagram! My favorite car trash bag is the one lined with yellow polka dots! So cute! I owuld love a car trash bag for my mom! My favorite is the car trash bag with the black and white print. Very cute! Those trash cans all look wonderful (and totally cute). I, too, would pick the green/apple one.